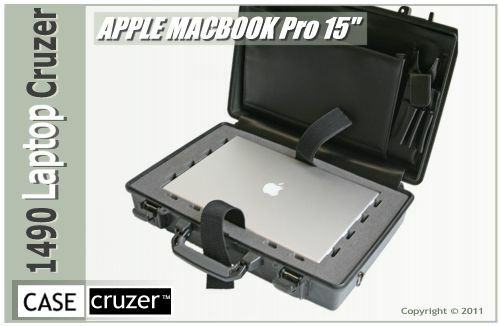 The 1490 Laptop Cruzer will hold an Apple (13.3-, 15" or Air) MacBook Computer and the power supply in the lower storage compartment. The sole mission of this tough, do-or-die briefcase is to safely secure the creativity of web developers, graphic designers, art directors, photographers, and video editors who travel or commute with an Apple MacBook Pro. 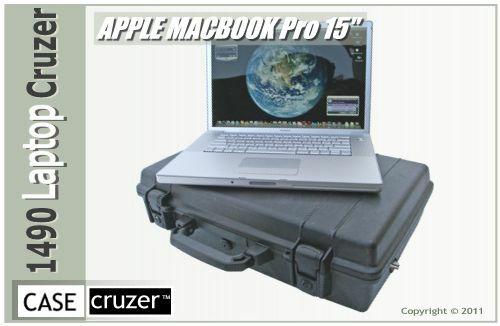 CaseCruzer provides you the protection and mobility that is essential when traveling with your gear. Whether you're a business nomad, a professional photographer, editor, designer/engineer or you're just jetting off on a family vacation, CaseCruzer is geared for travel. PSC100 - All in-one camera & laptop carrying case, holds one 13 to 17 inch laptop in the lid and photography gear inside adjustable padded divider. StudioCruzer PSC200 - Carry-on Apple Laptop & Camera Case features a customized foam cut-out lid for Mac Books and padded dividers to protect sensitive digital equipment. NiteCruzer - the protective Laptop Case / Overnight Carry-On for the MacBook Pro with room for essentials of business and travel. RED Digital Cinema, RED ONE are registered trademarks of RED Digital Cinema Camera Company. 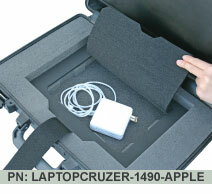 CaseCruzer, Photo StudioCruzer, NiteCruzer, LaptopCruzer, and WineCruzer are trademarks of CaseCruzer, LLC.